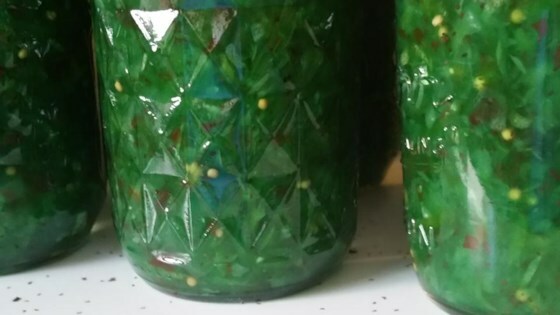 "This chunky relish is great for eating fresh or going into the pantry in the middle of winter cracking open a jar and putting on your hotdogs! Also great to add to macaroni salad!" Combine cucumbers, onions, red bell pepper, and green bell pepper in a large bowl; add salt and pour in enough cold water to cover. Allow to soak for 2 hours. Thoroughly drain in a colander. Pour vinegar into a large, heavy stainless steel pot; add celery seed and mustard seed. Stir sugar into mixture and bring to a boil, stirring until sugar is dissolved, 2 to 3 minutes. Add the drained vegetable mixture and return to a boil, about 10 minutes. Remove pot from heat. Sterilize the jars and lids in boiling water for at least 5 minutes. Pack relish into hot, sterilized jars, filling to within 1/4 inch of the top. Run a clean knife or thin spatula around the insides of the jars after they have been filled to remove any air bubbles. Wipe the rims of the jars with a moist paper towel to remove any food residue. Top with lids and screw on rings. Remove the jars from the stockpot and place onto a cloth-covered or wood surface, several inches apart, until cool. Press the top of each lid with a finger, ensuring that the seal is tight (lid does not move up or down at all). Store in a cool, dark area. Made 5 pints and tastes terrific - really easy. My family doesn't tolerate green pepper well, so put in a red & yellow. Thanks, for the recipe. This is the best sweet relish I have ever tasted. I make over 16 jars per year for family and friends. Mine did not look at all like the picture but it was easy to make and very tasty although quite sweet. Will try less sugar next time because I will make this again for sure! I think this sweet relish had a good flavor. I did add a tablespoon of pickling spice too. The recipe is very easy, used the food processor to dice the veggies. I love this relish. I use all red pepper for more color. This is really good but a little to sweet for my taste. I’ll make again but will cut the sugar back a bit. I liked that the recipe used cider vinegar instead of white vinegar.